^ "'The Eye Of The Storm' Wins at Melbourne International Film Festival". Yahoo! TV. 8 August 2011. Retrieved 14 December 2015. ^ Bulbeck, Pip (9 August 2011). "'The Eye Of The Storm' Wins at Melbourne International Film Festival". The Hollywood Reporter. Prometheus Global Media. Retrieved 14 December 2015. 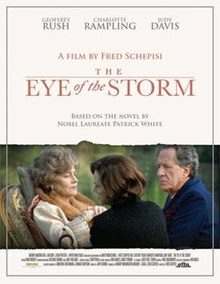 ^ "Sycamore presents Fred Schepisi's, The Eye of the Storm" (pdf). Paper Bark Films EOS Pty Ltd. 18 August 2011. p. cover. Retrieved 25 December 2012. ^ " Nominees for the 2011 Australian Academy of Cinema and Television Arts Awards Archived 4 March 2016 at the Wayback Machine. Australian Academy of Cinema and Television Arts. Retrieved 9 December 2011. ^ " Winners of the 2011 Inside Film Awards. Inside Film Awards. Retrieved 9 December 2011. ^ " Nominees of the 2011 Inside Film Awards. Inside Film Awards. Retrieved 9 December 2011. This page was last edited on 29 June 2018, at 18:05 (UTC).